Samsung’s Galaxy Tab S has always felt like a me-too device, an Android tablet built more out of necessity than love. 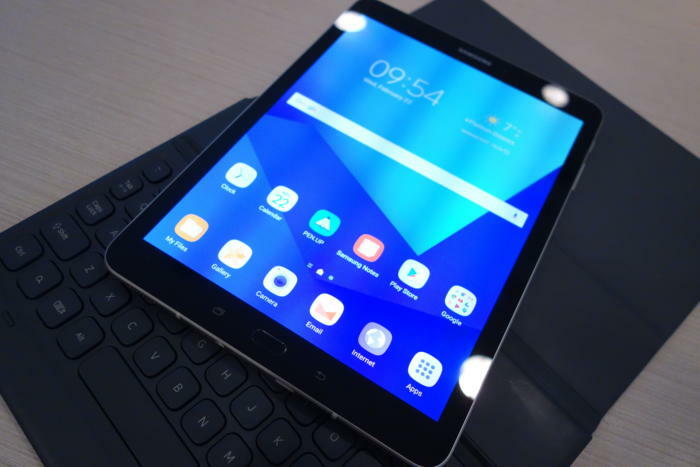 On the surface, it might seem like the Galaxy Tab S3 continues this trend, but this update to the 18-month-old Galaxy Tab S2 doesn’t merely bring Samsung’s flagship tablet up to speed. Indeed, with a bundled keyboard and new and improved S Pen in tow, the Tab S3 is also a bid to fill the sizeable productivity hole left behind by the Note7. And it just might work. While we’re all waiting to get our hands on the Galaxy S8— possibly the most anticipated Android phone of all time—Samsung has borrowed some of the best features from the Note 7 to create a tablet truly worthy of the Galaxy name. Nearly every other Android tablet on the market is a plastic, budget offering, so holding the Galaxy Tab S3 is somewhat startling at first. Where the S2 had a polycarbonate back that made it feel cheaper than it should, the S3 brings a premium glass enclosure that rivals the iPad Pro’s build quality. The back of the Galaxy Tab S3 is made of glass—and it feels wonderful. It’s ever-so-slightly thicker than its predecessor and a touch heavier—which Samsung attributes more to a quad speaker system than the materials it used—but I barely noticed the extra weight while holding the tablet for several minutes. The case attracts the multitude of fingerprints you’d expect from such a glossy, smooth surface, but the higher-end materials make the S3 feel like a true premium Android tablet. The front of the device is nearly identical to the S2, with a home button/fingerprint sensor flanked by a pair of capacitive navigation buttons. There’s a USB-C port instead of microUSB, but, really, the only noticeable thing that’s changed is the color. 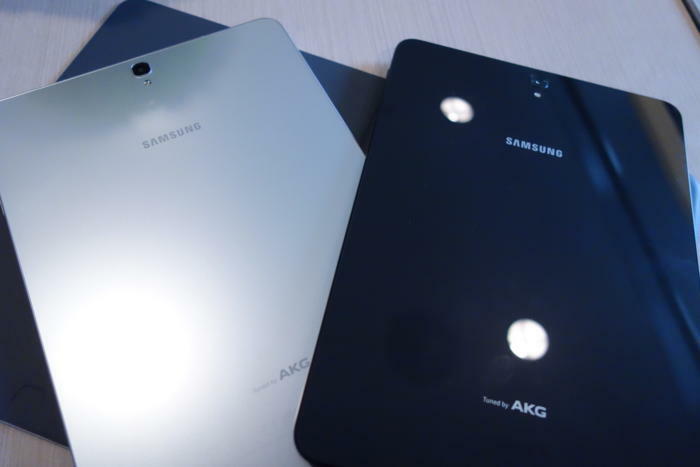 While the tablet comes in black and silver varieties, that only applies to the back plate. The front of both models are black, so if you’re a fan of the white frame you’re out of luck. You can get the Tab S3 in any color so long as it’s black. Now, there’s nothing necessarily wrong with Samsung’s design choices, though the off-center placement of the USB port still bothers me, as does the sideways Samsung logo when the S3 is docked. 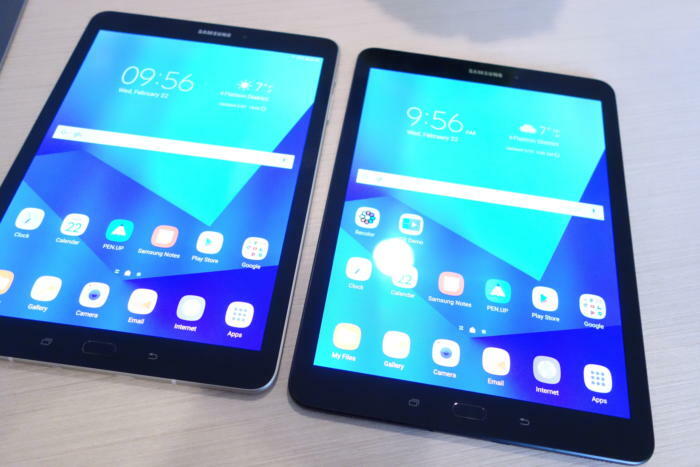 But in this age of edge-to-edge screens and skinny bezels, it’s a little surprising that Samsung went with a years-old design for a flagship Galaxy tablet. It feels a little like the Galaxy S5 did back in 2015—serviceable but a little stale. Samsung is clearly positioning the Tab S3 as a premium device—the Galaxy response to the iPad Pro. Under the hood, the S3 is powered by a Snapdragon 820 chip, a move away from Samsung’s own Exynos processors. But Qualcomm is more than up to the task, and everything about the S3 felt snappy, from changing apps to scrubbing through HD movies. And support for the Vulcan API will benefit gaming as well. The Galaxy Tab S3 includes a 13MP camera, just like the one on the Galaxy S7. Four stereo speakers are tuned by AKG Acoustics and auto-calibrated based on the way you’re holding the device. Samsung’s demo room didn’t have the greatest acoustics, but the sound coming from the speakers was still rich, and should provide a stellar movie-watching experience, especially if coupled with the display’s HDR support. There’s a 13MP camera on the back and a 5MP on the front—so take note if you use your tablets for videoconferencing or (yikes) still photography. 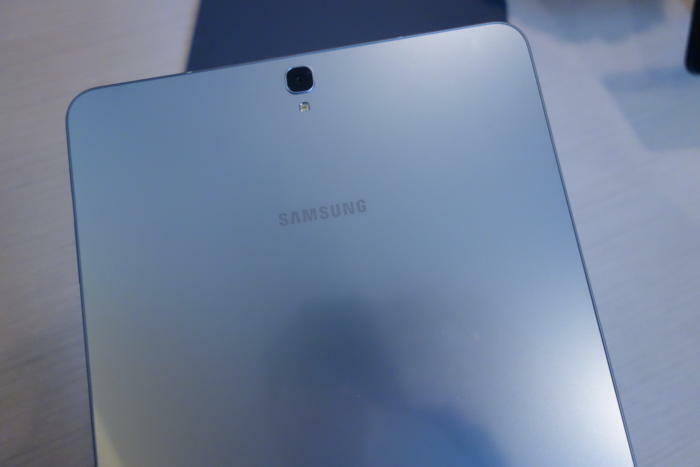 Unlike the Galaxy Tab S2, there’s no smaller 8-inch version for the S3. Samsung said it wanted to emphasize the tablet’s productivity story, but I see no reason why its various productivity features wouldn’t work on an 8-inch device (after all, the Note is only 5.7 inches). But for now, it’s all about the larger model, and while pricing wasn’t released, you don’t have to spend much time with it to see that it will likely cost upwards of $500 or $600. For all its inevitable premium pricing, the Tab S3 includes a new and improved S Pen, and you can also buy an optional Pogo pin keyboard, both firsts for the Galaxy Tab S series. 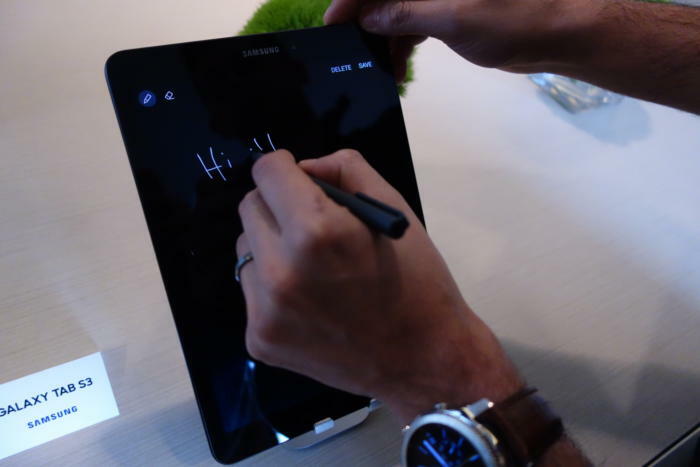 However, you’re going to need to keep tabs on your stylus, as there isn’t a Note-style slot on the tablet to store it. Samsung has added a clip to the top of the writing implement, like what you’d find on a standard ball-point pen, but it’s not designed to attach to the S3 in any way. Samsung’s keyboard attaches via a magnetic port on the side of the device. It’s a bit of a bummer, because the Galaxy Tab S3 is the tablet version of the Note7 in nearly every other way. Most notably, its 9.7-inch 2048x1536 AMOLED screen features the High Dynamic Range support that was first introduced on the phablet, allowing for a wider color gamut when watching compatible movies and TV shows. I watched some scenes from A Million Ways to Die in the West in both standard HD and HDR, and the differences between the colors in a sunset and sunlight illuminating faces were striking. But while entertainment features might still be the primary drivers behind tablet purchases, the S3 is far from a consumption-only device. 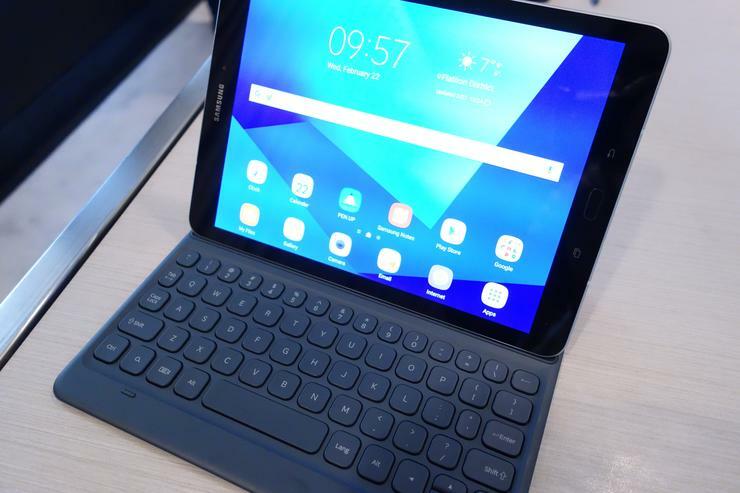 The keyboard is pretty standard, attaching via a magnetic connector on the edge and holding the tablet at a fixed angle. It's just as comfortable to use as Apple’s Smart Keyboard or Microsoft’s Surface Touch Cover, but it’s mainly a typing instrument, and doesn’t offer any tricks to help with navigation or multitasking. That’s where Samsung’s S Pen comes in. 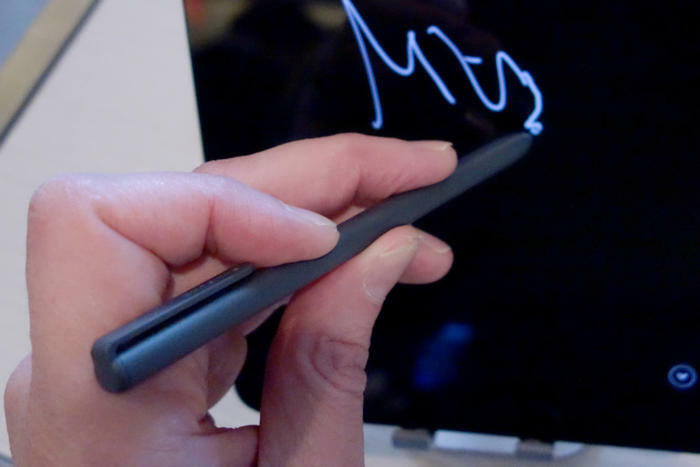 The S3 runs Android 7.0, and adopts all of the Note’s stylus tricks, including the Air Command action panel, and the ability to jot down memos when the display is off. Samsung has improved the look and build of the S Pen for the S3 as well, giving it more of a traditional feel. The screen-off memos feature is cool, but I don’t see it being all that useful on a tablet. 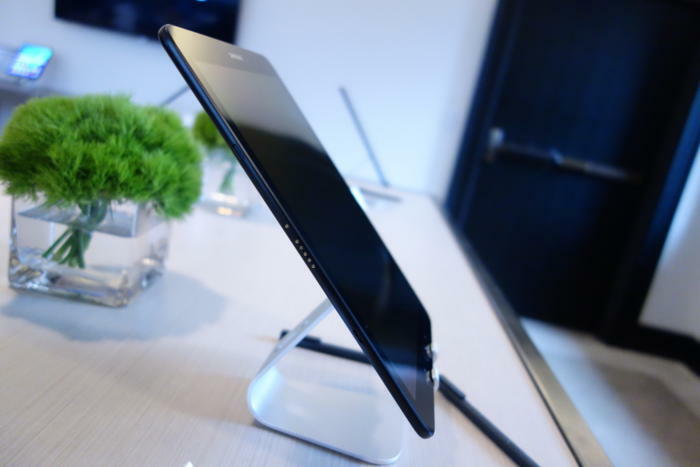 It has the same 4,096 levels of pressure sensitivity as the Note 7’s S Pen, and the rubber tip glided smoothly across the screen whether the tablet was resting flat on a table or propped in the keyboard dock. It felt like a ball-point would across a sheet of paper. It’s light enough to hold for extended periods of time, and since it doesn’t depend on Bluetooth, you can use it without any concern for pairing or charging. The S Pen is a great addition to the Galaxy Tab S3, even without a way to attach it to the device. The Air Command menu, summoned by hovering the S Pen over the screen, is the same as the one on the Note 7. It includes shortcuts to note and GIF creation, screenshot capture, annotation, translation, and magnification, and it adds a level of multitasking to the tablet that wasn’t there before. There’s also support for the off-screen memos feature (which lets you take handwritten notes without needing to turn on the screen), but it seems more suited to an on-the-go phone feature than a tablet one. Still, though, it’s great to see Samsung properly implement S Pen support into a high-end Android tablet. The question remains whether Samsung can convince Android users that they need to buy a tablet. The Galaxy Tab S3 might be the best tablet you can buy, but that’s not saying a whole lot in a market littered with devices that are often given away with new phone purchases. The Galaxy Tab S3 is a great package that Samsung has to convince people to buy. The S3 will almost certainly be marketed alongside the S8 once it’s released, but in my time with the tablet, I got the feeling that it’s less of a companion this time around, and more of a standalone device with its own story to tell. I’m not currently using a Galaxy phone as my daily driver, but I could definitely see myself using a Galaxy Tab S3 for working at my desk for long stretches. Samsung just has to convince a few million more people that they should, too.